The brain is the part of the central nervous system located in the skull. It controls the mental processes and physical actions of a human being. The brain, along with the spinal cord and network of nerves, controls information flow throughout the body, voluntary actions such as walking, reading, and talking, and involuntary reactions such as breathing and digestion. The human brain is a soft, shiny, grayish-white, mushroom-shaped structure. The brain of an average adult weighs about 3 lb (1.4 kg). At birth, the average infant's brain weighs 13.7 oz (390 g); by age 15, it has nearly reached full adult size. The brain is protected by the skull and a three-layered membrane called the meninges. The brain's surface is covered with many bright red arteries and bluish veins that penetrate inward. Glucose, oxygen, and certain ions pass easily across the blood-brain barrier into the brain, although other substances, such as antibiotics, do not. The four principal sections of the human brain are: the brain stem, the diencephalon, the cerebrum (divided into two large paired cerebral hemispheres), and the cerebellum. The brain stem connects the brain with the spinal cord. Every message transmitted between the brain and spinal cord passes through the medulla oblongata —a part of the brain stem—via nerve fibers. The fibers on the right side of the medulla cross to the left and those on the left cross to the right. As a result, each side of the brain controls the opposite side of the body. The medulla regulates the heartbeat, breathing rate, and blood-vessel diameters; it also helps coordinate swallowing, vomiting, hiccuping, coughing, and sneezing. Another brain stem component, the pons (meaning "bridge"), conducts messages between the spinal cord and the rest of the brain, and between the different parts of the brain. The midbrain conveys impulses between the cerebral cortex, pons, and spinal cord, and also contains visual and audio reflex centers involving the movement of the eyeballs and head. Twelve pairs of cranial nerves originate in the underside of the brain, mostly from the brain stem. They leave the skull through openings and extend as peripheral nerves to their destinations. Among these cranial nerves are the olfactory nerves that bring messages about smell and the optic nerves that conduct visual information. The diencephalon lies above the brain stem and embodies the thalamus and hypothalamus. The thalamus is an important relay station for sensory information, interpreting sound, smell, taste, pain, pressure, temperature, and touch; it also regulates some emotions and memory. The hypothalamus controls a number of body functions, such as heartbeat and digestion, and helps regulate the endocrine system (hormonal system) and normal body temperature. The hypothalamus signals hunger and thirst, and also helps regulate sleep, anger, and aggression. Constituting nearly 90% of the brain's weight, the cerebrum is divided into specific areas that interpret sensory impulses. For example, spoken and written languages are transmitted to a part of the cerebrum called Wernicke's area where meaning is constructed. Motor areas control muscle movements. Broca's area translates thoughts into speech, and coordinates the muscles needed for speaking. Impulses from other motor areas direct hand muscles for writing and eye muscles for physical movement necessary for reading. The cerebrum is divided into left and right hemispheres. A deep fissure separates the two, with the corpus callosum, a large bundle of fibers, connecting them. By studying patients whose corpora callosa had been destroyed, scientists realized that differences existed between the left and right sides of the cerebral cortex. The left side of the brain functions mainly in speech, logic, writing, and arithmetic. The right side, on the other hand, is more concerned with imagination, art, symbols, and spatial relations. In general, the left half of the brain controls the right side of the body, and vice versa. For most right-handed people (and many left-handed people as well), the left half of the brain is dominant. The cerebrum's outer layer, the cerebral cortex, is composed of gray matter, which is made up of nerve cell bodies. About 0.08 in (2 mm) thick with a surface area about 5 sq ft (0.5 sq m), it's nearly half the size of an office desk. White matter, composed of nerve fibers covered with myelin sheaths, lies beneath the gray matter. During embryonic development, the gray matter grows faster than the white and folds in on itself, giving the brain its characteristic wrinkles, called convolutions, or gyri; the grooves between them are known as sulci. The cerebellum is located below the cerebrum and behind the brain stem. It is butterfly-shaped, with the "wings" known as the cerebellar hemispheres; the two halves are connected by the vermis. The cerebellum coordinates many neuromuscular functions, such as balance and coordination. Disorders related to damage of the cerebellum often result in ataxia (problems with coordination), dysarthria (unclear speech resulting from problems controlling the muscles used in speaking), and nystagmus (uncontrollable jerking of the eyeballs). 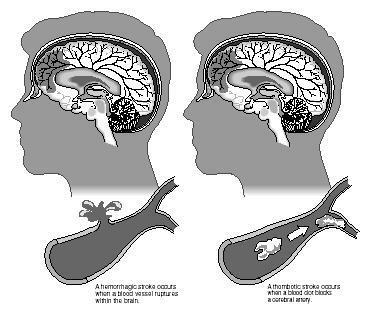 A brain tumor that is relatively common in children known as medulloblastoma grows in the cerebellum. Neurons carry information through the nervous system in the form of brief electrical impulses called action potentials. When an impulse reaches the end of an axon, neurotransmitters are released at junctions called synapses. The neurotransmitters are chemicals that bind to receptors on the receiving neurons, triggering the continuation of the impulse. Fifty different neurotransmitters have been discovered since the first was identified in 1920. By studying the chemical effects of neurotransmitters in the brain, scientists have developed treatments for mental disorders and are learning more about how drugs affect the brain. Scientists once believed that brain cells do not regenerate, thereby making brain injuries and brain diseases untreatable. Since the late 1990s, however, researchers have been testing treatment for such patients with neuron transplants, which introduce nerve tissue into the brain, with promising results. They have also been investigating substances such as nerve growth factor (NGF), which may someday help regenerate nerve tissue. Technology provides useful tools for researching the brain and helping patients with brain disorders. An electroencephalogram (EEG) records brain waves, which are produced by electrical activity in the brain. It is obtained by positioning electrodes on the head and amplifying the waves with an electroencephalograph. EEGs are valuable in diagnosing brain diseases such as epilepsy and tumors. MAGNETIC RESONANCE IMAGING (MRI). Using a magnetic field to display the living brain at various depths, MRI can produce very clear and detailed pictures of brain structures. These images, which often appear as cross-sectional slices, are obtained by altering the main magnetic field of a specific brain area. MRI is particularly valuable in diagnosing damage to soft tissues, such as areas affected by head trauma or stroke . This is crucial when early diagnosis improves the chances of successful treatment. MRI also reveals tumors and other types of brain lesions. POSITRON EMISSION TOMOGRAPHY (PET). During this test, a technician injects the patient with a small amount of a substance, such as glucose, that is marked with a radioactive tag. By tracking the radioactive substance as it travels to the brain, physicians can see almost immediately where glucose is consumed in the brain. This indicates brain activity, an important factor in diagnosing epilepsy, Alzheimer's, or Parkinson's. PET is also valuable in locating tumors and brain areas that have been affected by a stroke or blood clot. MAGNETOENCEPHALOGRAPHY (MEG). Magnetoencephalography measures the electromagnetic fields created between neurons as electrochemical information is passed along. Of all brain-scanning methods, MEG provides the most accurate indicator of nerve cell activity, which can be measured in milliseconds. By combining an MRI with MEG, clinicians can get a noninvasive look at the brain that is especially useful in diagnosing epilepsy or migraines, for example. MEG also helps identify specific brain areas involved with different tasks. Any movement by the patient—wiggling the toes, for example—appears on the computer screen immediately as concentric colored rings. This pinpoints brain signals even before the toes are actually wiggled. Researchers foresee that these techniques could someday help paralysis victims move by supplying information on how to stimulate their muscles or indicating the signals needed to control an artificial limb. Bear, Mark F., Barry W. Connors, and Michael A. Paradiso. Neuroscience: Exploring the Brain. Baltimore: Williams and Wilkins, 1996. Burstein, John. The Mind by Slim Goodbody. Minneapolis, MN: Fairview Press, 1996. Carey, Joseph, ed. Brain Facts. Washington, D.C.: Society for Neuroscience, 1993. Greenfield, Susan A., ed. The Human Mind Explained: An Owner's Guide to the Mysteries of the Mind. New York: Henry Holt, 1996. Howard, Pierce J. The Owner's Manual for the Brain: Everyday Applications from Mind-Brain Research. Austin, TX: Leornian Press, 1994. Jackson, Carolyn, ed. How Things Work: The Brain. Alexandria, VA: Time-Life Books, 1990.